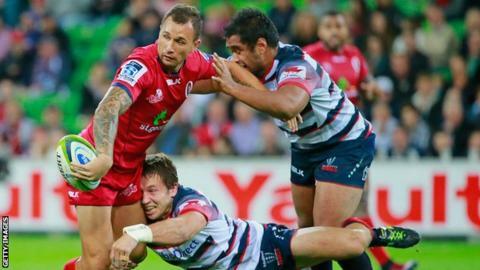 Australia and Queensland Reds fly-half Quade Cooper has agreed a two-year deal to join French club Toulon this summer. The 27-year-old, who has 53 international caps, will link up with countrymen Matt Giteau and Drew Mitchell at the Top 14 side. French champions Toulon are chasing a third consecutive European title and play Clermont in this year's final. Australia recently announced a partial reversal of their policy to only select domestic-based players. The Wallabies will now allow foreign-based international players to continue their Test careers if they have played 60 internationals and seven years of Super Rugby. Sir Clive Woodward, who won the World Cup as England coach in 2003, welcomed the move and said England should follow suit.